So we put a trailer together for ROO. It took a couple of days to do and was a lot of fun. But why is this news-worthy? 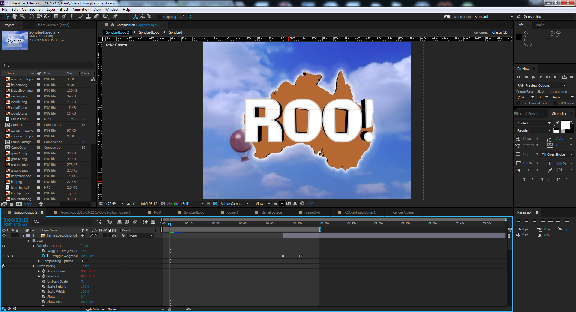 Well, apart from the fact that Roo is a fun game and shouting about it increases the chances of someone else having some fun (which is always a good thing) - I actually used some new video editing techniques in putting the trailer together which might be interesting for some people to read about. Putting a trailer together looks really simple - and ROO being a very simple game, appears that it should be a very easy thing to do. Well, in a way it was a lot easier than putting a trailer for perhaps a movie or a show. (I've not edited a movie or show trailer - but after editing the London Part Deux game jam video, I can only imagine the difficulty involved). 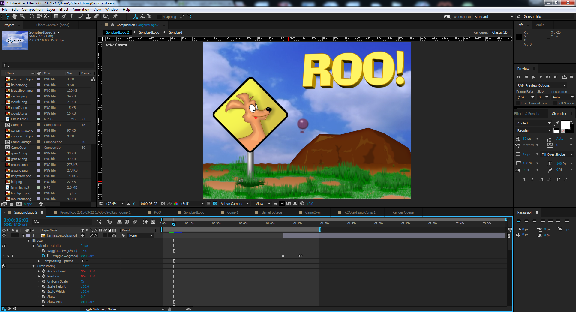 Even though ROO is a simple and fun game, it's not enough to just capture footage and slap it into a video. When you consider it, you have more time in-game to enjoy the everything the game has to offer but only a tiny amount of time in a trailer video to show the goods and hook a potential player. Before I start, I'll admit - I'm not an expert (watching the trailer will attest to that) but as with most Indy developers, I don't have a marketing department (or a budget for that matter) to give the task to, who can spend their considerable skills and experience putting something amazing together. Unfortunately, until Songbird-Creations becomes somewhat bigger, everything is in-house by those who wear many many hats. So this Trailer, how was it made? Well, just like any other task in game development, you need to have the right tools for the job. I'll be putting some articles together over the coming months describing the tools we use and why we use them. 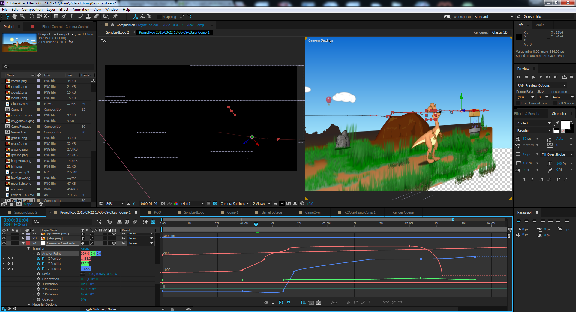 But for video editing, we use Adobe After Effects. 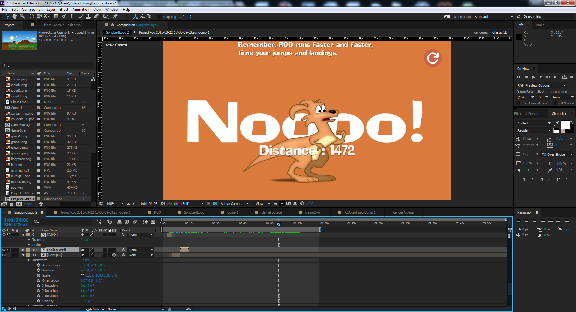 Now, Adobe After Effects is a professional level tool which can accomplish a devastatingly overwhelming number of things. It's so powerful that most people will only ever scratch the surface of its potential and it used to have a price tag to match - which was normally sidestepped by pirates - however, through some amazing vision, Adobe have licensed their entire suite of software on a subscription basis, so it's not expensive any more. So there's no longer any justification in pirating (to learn it) and you get the added bonus of Photoshop and Illustrator (amongst others) included too. The trailer is broken down into 4 main sections. The introduction shows our company logo and the Game's title. This is important to get right as it's the first thing the viewer sees. It has to get them interested enough to want to watch the rest. Viewers have a lot of content they can watch instead, so a video has to be worth it and someone making a video has to respect that time. 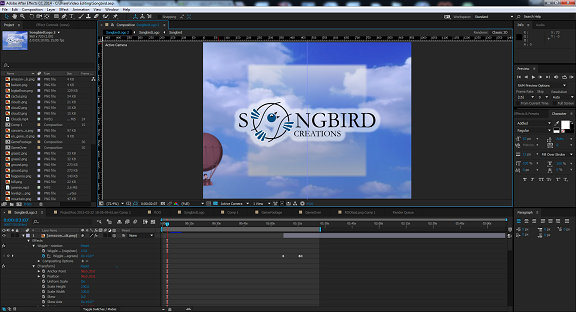 So I open up with the Songbird creations logo, some clouds and a Balloon. This is supposed to set up the viewer with the company signature and they follow the balloon towards the game's title when it appears. The balloon appears in the game in the distance. The balloon itself is from a game which was never completed which starred a cartoon version of my Wife, meaning that She's in every game I make in some way - kind-of like Stan Lee in all Marvel movies. The screen then changes to show something similar to the in-game titles. All of this should only take a few seconds. Then we need to get the viewer right into the story. ROO! has a very simple story where little Timmy has fallen down a well (again!) and it's up to Roo to get help. To do this, I wanted to have a scene I could move around in. 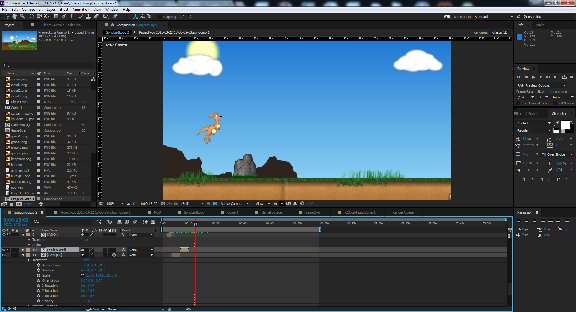 This meant setting up a 3D scene so that I could have proper Parallax backgrounds to add a sense of depth to it. I could have done this by panning from left to right in a 2D scene, but it would have actually meant more work. After Effects has everything you need to manipulate a 3D scene; you can place cameras, manipulate them with dummy objects, alter their positions, rotations (and pretty much any property they have) all smoothly using key frames. So I built the scene using real assets from the game and animated the camera to tell the story. 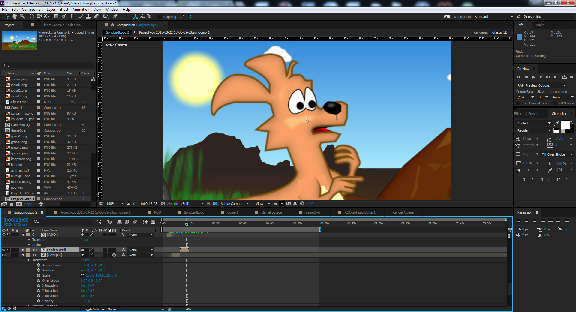 Roo and Timmy are in the outback (although Timmy is never shown) Timmy sees a well, and falls in - the camera pans and zooms in on the well. Following the splash, the camera quickly pans to Roo who looks suitably concerned. This is the part where we let the potential player know what the game is all about, what to expect and why they should play the game. ROO! is a very simple game, it starts out easy enough and gets progressively more difficult as it becomes faster and have less time to react. Eventually the player will succumb as their reactions become less able to dodge the oncoming obstacles - ROO moves at a fair lick of speed when he gets going. The game is a mobile game for the most part, so to get the footage, I recorded the PC version using Fraps and ran through the game many times. My hope was to get a high enough score to show the game running a breakneck speed as well as record some amusing failures. The resulting movie file was 7.8gb - I'd have to edit it... a lot. 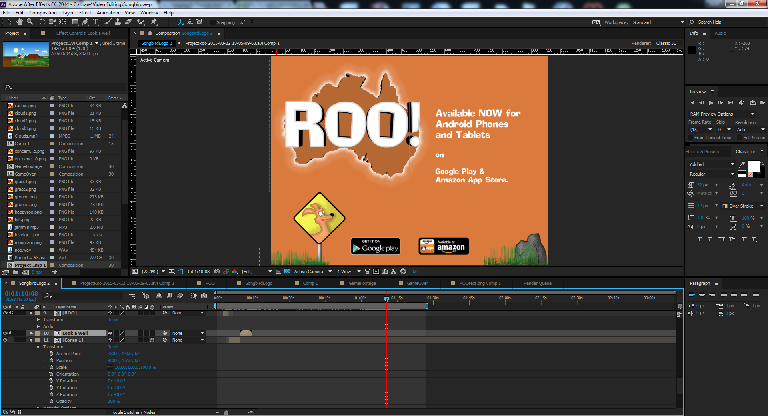 Roo is a game which can't really be shown off in static images, they don't do it any justice so hopefully the video does the trick. I cut several failures back to back for laughs, then did a run as far as I could get. The entire section is about 50 seconds long and basically shows the game in it's entirety. It sounds a little sad when said like that, but it's strange how something so simple can keep people engrossed for so long. At the end of the gameplay section, is the Noooo section which normally greets every failure. A trailer is after-all a marketing video so there needs to be something which informs the potential customer where to go next to find out more and potentially buy the game. On this part of the video I wanted to show where the customer could get the game from - in this case the Google Play store as well as the Amazon App store. Later we'll have the App Store, Windows store and quite probably the OUYA market place. As these become available, we'll have to upload other videos - potentially replacing this one. I didn't want to put a Coming Soon part on the video as I wanted it to be Factual, to 'close the deal' right now. When we're on the other stores, we'll be factual about that too. The entire video is just short of 1:27 and is accompanied with the opening titles music for the game. Although it is tricky, I tried to keep as much of the video in time with the music to keep them from feeling disconnected. I even make the Google Play and Amazon store logos dance to the music towards the end of the video. As I said, putting a trailer together is Marketing, you have to try to get people interested in your product. Without marketing, a game is a fun programming exercise. If you want people to play your game, you need to let them know about it and a trailer is a good starting point.